Soldiers' Angels - Baby Leanne Loves her Gifts! Baby Leanne Loves her Gifts! The Soldiers' Angels Operation Top Knot Team helps welcome beautiful bundles of joy into the world, like baby Leanne. Leanne's mom, Roxanne, is an active duty service member in the US Navy. Operation Top Knot put together a 'virtual' baby shower to welcome Leanne into the world and take some stress off of her brave mom, who is currently stationed overseas. The gifts even included some special handmade items from the Soldiers' Angels Sewing and Crafting Team - a knit blanket, handmade booties, and handmade hats. There were even some Mary Kay lotions included just for mom. 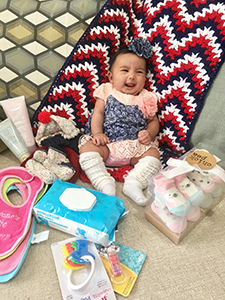 If you are interested in helping welcome military babies through virtual baby showers, learn more about the Soldiers' Angels Operation Top Knot Team here.